Some of you may know that Emmy and I are members of a cool little gaming community called Gamers With Jobs. Well, once upon a time, GWJ had a podcast, called GWJ Radio, which was hosted by Shawn Andrich, one of the site’s founders, and Russ Pitts, one of the site’s most prolific, talented, insightful, and hilarious writers. Sadly for fans of GWJ Radio (but happily for him) Russ was recently hired to work as an editor for the avante garde weekly gaming web-based magazine The Escapist and was no longer able to continue hosting and producing GWJ Radio as a result. It seems fate is kind, though, as after several months of constant badgering, Russ’ bosses over at The Escapist have allowed him to resurrect the show as Escape Radio. Make no mistake, though; other than the name, it is the same brilliant show that was once called GWJ Radio. Why should you listen to a podcast about gaming if you are not an avid gamer? Well, because the show that Shawn and Russ produce is has a great sense of humor, discusses gaming culture in a way that is accessible to anyone without being pandering, and feels like listening in on fascinating ongoing dialogue between two friends who share the same passion but have markedly different outlooks on life. So give it a download and a listen. Maybe even check out some of the old GWJ Radio episodes, because even though the news and games they discuss may be aging, the discussions themselves remain intriguing. And while you are at it, you might enjoy checking out the other things that Gamers With Jobs and The Escapist have to offer. Both sites feature some of the best writing on gaming, gaming culture, and the games industry that you will find on the internet. Also, (since i have never really bothered to plug it) GWJ is one of the coolest communities of adult gamers you will ever come across. Not only is it a wonderful place to find great people to play your favorite games with (anything from Civ to Battlefield to the latest Xbox 360 games), but it also features lively discussions of news, politics, TV, movies, and everything else that nerds love to talk about. So….if you’ve made the webcomics circuit this morning, you’ve probably seen this, but if not, here you go. So, I foolishly challenged Pat to uncover my physical location earlier tonight. To make a long story short, I’ve decided that I’m going to be moving to a new apartment as soon as I possibly can. At one point during his investigation, Pat found this group on Google, an archive of a very old Usenet group that I posted on back while I was in Junior High School. The game in question is Nethack, an old text-based RPG. Going back and reading through my previous posts was possibly one of the most “grounding” experiences I’ve ever willingly put myself through. Basically, I have no idea how I got into college. This is a neat thing but I think most new players (including me) CAN’T get into wizard mode. I’ll be happy if you can just get me into it. Someone said somthing about downloading nh313386.exe (Andy?). Well, I did once and it screwed my chdir. My second time it said something about a status error and let me play, but I couldn’t get into wizard mode. You require a “source file” or something?? Do you need a compiler?? My last character got up to his quest and died. Sorry, it is a WMV file, but it is so cool that you probably won’t care. Want to play the game? Get a beefy PC, an Xbox 360, or PS3. It will be out on all three platforms as a bonus with the release of Half-Life 2: Episode 2 later this year (or early next year, perhaps). As is always the case, more info can be found at Wikipedia. Here is a trailer for another little piece of game that will be shipping with the Half-Life 2: Episode 2 pack. Whereas Portals looks to be a first person puzzle game and Half-Life itself is a single player FPS experience, this (Team Fortress 2) is a multiplayer only FPS game. The trailer doesn’t really show much about the gameplay, but the visual style looks pretty damn cool. That Team Fortress 2 link was dead for a while, but I’ve fixed it now. Check it out! Yep. My e-mail is read at the 22:36 mark. This is why I love my Wednesday nights. Not the country, the board game that thousands upon thousands of nerds on the internet seem to think is one of the best board games ever made. Anyway, I bought a copy of it yesterday, since like many other German games it is quite hard to come by, so it is difficult to pass up when you see it sitting on a shelf. And after reading the instructions, I’m not surprised that people like it so much — it sounds very cool. The problem, though, is that like so many other German board games that I have bought and enjoyed (such as Settlers of Catan, Carcassonne, and Tigris and Euphrates), the rules are quite complex. So as fun as the game may be, I’m afraid that I may not be able to play it very often due to the daunting task of introducing new players to the rules. So I did a bit of digging around on the internet trying to find a bit of help, but I’m not sure about the results. How about this good, clean summary of the rules? Too dry, perhaps? Maybe this strategy guide for beginners would be helpful? 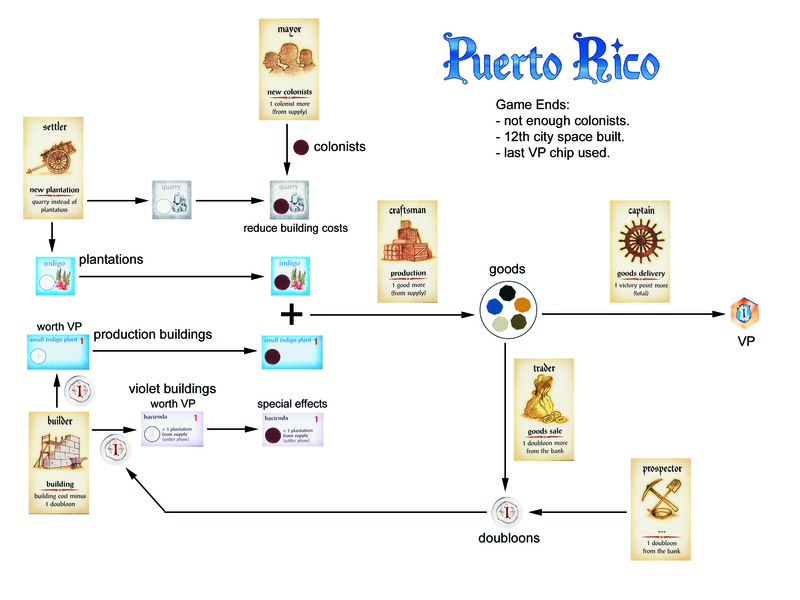 Or this flow chart describing how the various phases of the game work. I don’t know. What do you all think?